Okeene is located in the picturesque Cimarron Valley and just to the southeast of the gypsum hills that comprise the Gloss Mountains. An afternoon drive through the area is a unique experience observing the diverse geologic formations that crop up seemingly out of nowhere. Experience the color, spires, turrents, flat top mesas, and the sparkling Selenite Gypsum crystals that cover the surface of the bold buttes. 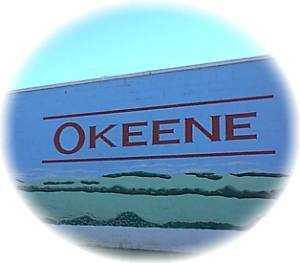 Okeene was founded in 1892 when the Cheyenne and Arapaho Indian lands were opened for settlement. After a handful of businesses were established, the Town Company decided it was time for a name. Following a long discussion and several rounds of drinks, it was suggested that they take the first two letters of Oklahoma, the last two of Cherokee, and the last two of Cheyenne, OK-EE-NE, and pronounce it Okeene. Okeene is famous for its annual rattlesnake hunt and prides itself on being the home of the original rattlesnake hunt. The hunt, held annually around the end of April or early May attracts participants, spectators and those who are simply curious from around the world. Two other favorite attractions in the area are the Roman Nose Resort Park and Canton Lake. Named after Cheyenne chief , Henry Roman Nose, Roman Nose Park is located nearby and has restaurant and accommodation facilities as well as backpacking, biking, hiking, horseback riding, boating, water skiing, badminton, golf, hayrides, volleyball, fishing, canoeing, and an Indian adventure program. Canton Lake was originally built by the Army Corps of Engineers to mitigate flooding of the Canadian River. Today it is a popular tourist, boating and fishing attraction and home of the annual Walleye Rodeo, a must for every fisherman. The Okeene Rattlesnake Round-Up is listed in the Worldwide Brochures Travel Dictionary as home of "THE Original Rattlesnake Hunt". People from all over the world have come to visit us. We are looking forward to seeing YOU the first week in May!